For jumpers, a correct 2 point position is fundamental to be in harmony with the mount and apply light but effective aids. Flowing with the movement with ease by allowing the closing and opening motion of the joints –hips, knees and ankles - enables the rider to influence the horse effectively without impeding the horse’s motion especially when approaching a fence or at landing. This 2 point position can also release the horse’s back at the time he needs all the freedom of movement possible during the different jump phases. To Michel, this position is not only effective but is also nice to watch. It brings out the feelings of lightness and harmony that characterise the beautiful way great champions ride. 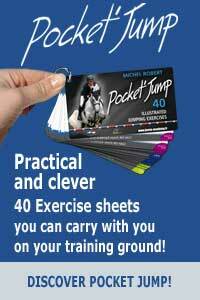 Michel offers here a very good exercise to practise as often as possible in order to improve the 2 point position. 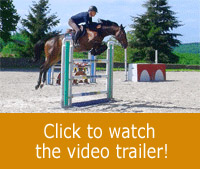 This practice will be good for stiff riders looking for a better connection with their horses. For all rider, it‘s a good way to test if their position allows them to face any kind of situations. To show the exercise, Michel teaches Charlotte, riding her own mare Cendrillon. He reminds his student about the key elements that will allow her to follow the movement while well balanced on her feet. It will prevent her from making the common mistakes that lead the riders to hold their balance with the reins and crush the horse’s back. The exercise can be practised at the three gaits to get the feel for the changes of balance throughout the phases of the movement.